I have just returned from my holiday in Hokkaido and Tokyo; you'd think that I would like a change from Japanese cuisine... definitely not. Japanese is the one cuisine that I don't think that I can ever get tired of. What I love about good Japanese food is it's focus on freshness, seasonality and simplicity; qualities which are clearly on display at Minus 8. 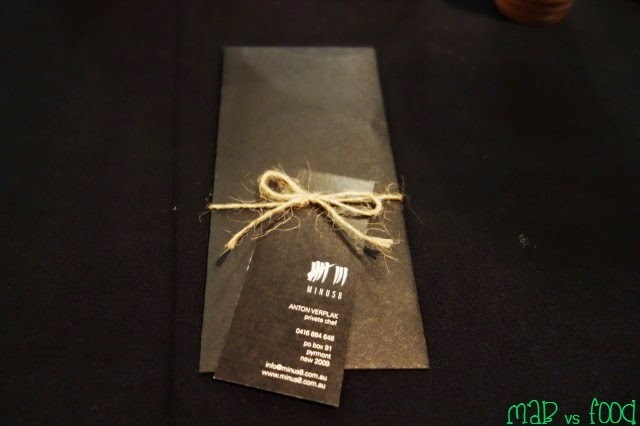 Minus 8 is a pop up restaurant that hosts underground dinners several times a month, serving contemporary Japanese cuisine using local ingredients to 12 lucky diners each night. The man behind Minus 8 is private chef Anton Verplak, a horticulturist turned chef who has worked at a number of Japanese restaurants around the world including the Michelin-starred Nobu in London. The underground dining experience is something that is new to me. You go to a secret location (which was a suburban apartment this time, but it could be an old warehouse or a carpark), and you wine and dine with a group of strangers that share the same passion as yourself for good food. 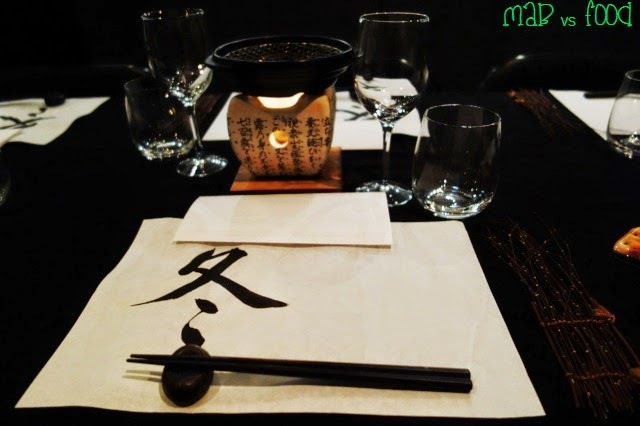 For me the intimacy and the air of mystery and not knowing what to expect is what makes Minus 8 and other underground dining venues exciting for me and worth keeping an eye out for. To go to one of these events, you need to get invited. This means you need to join Minus 8's mailing list to get updates on when the next series of dinners will be held. And you need to be quick as spots are filled up on a first- come-first-served basis. I dined at Minus 8 with Crystal (from Delectably Degusting and cc_crystal on Instagram) and her 2 friends. Crystal proved that, in the 21st century, Instagram is an effective (and sometimes hilarious) way to organise gatherings! I was the first to arrive and was warmly greeted by Anton. 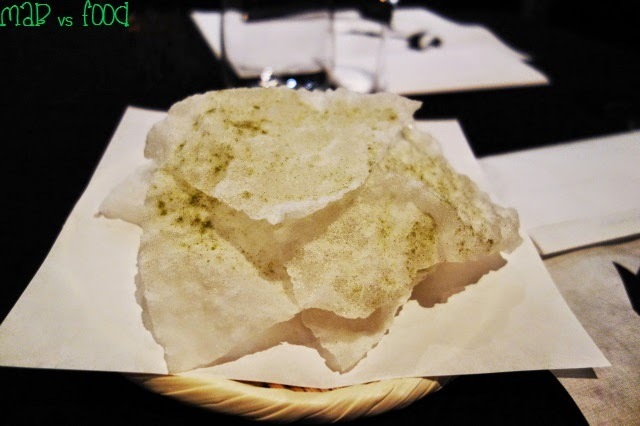 As I took my seat, a plate of rice crisps with wasabi salt was placed on the table for me to nibble on as I waited for the other diners to arrive. These were paper-thin, light and crispy. The feeling of the heat from wasabi travelling up my nose is a feeling that I am addicted to. I must have had 5 of these before the meal even started. 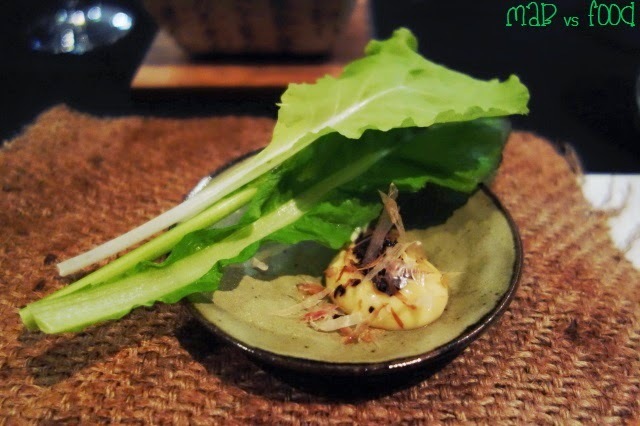 The first course of the evening is a bit of a mouthful to say but essentially it's fresh Japanese mustard greens served with a mayonnaise dipping sauce. 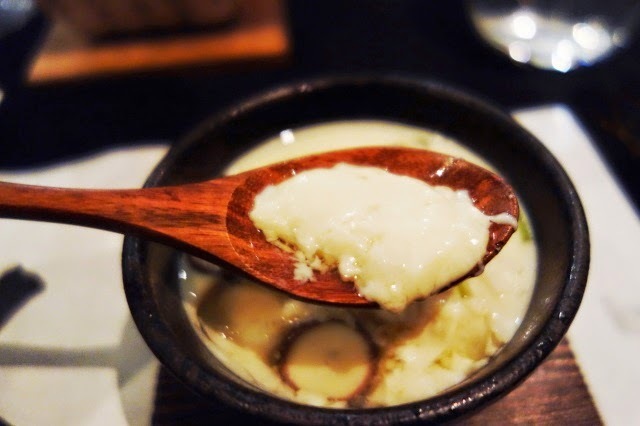 The mayonnaise was delicious and loaded with umami from konbu, shoyu and dried bonito flakes. I still had leftover mayo after I had eaten all the greens, so I promptly ran my finger through the mayo to mop up any traces of it. 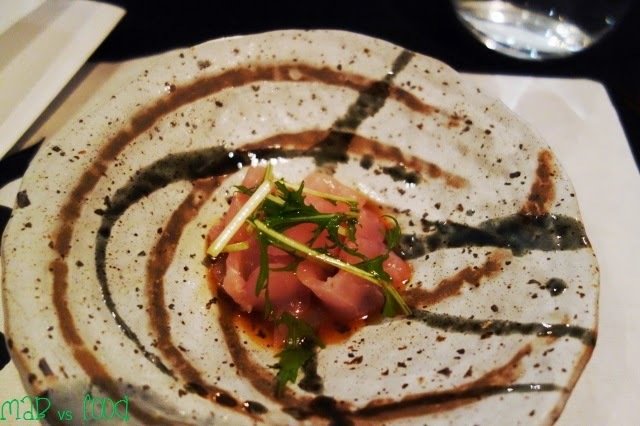 The second course of the evening was a namasu of alfonsino (a Japanese dish consisting of raw fish marinated in rice vinegar for several hours, similar to a ceviche). The alfonsino had a fresh, sweet and delicate flavour, which went well with the zestiness of the kumquat ponzu. 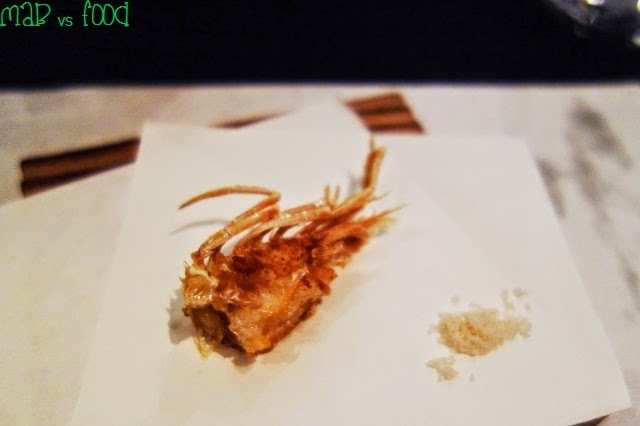 Next up was a tempura prawn served simply, with just sea salt. Anton explained to us that the Kansai (Kyoto) style of tempura is paler than the Kanto region (Tokyo), which is more a nutty brown, due to the absence of egg in the batter. 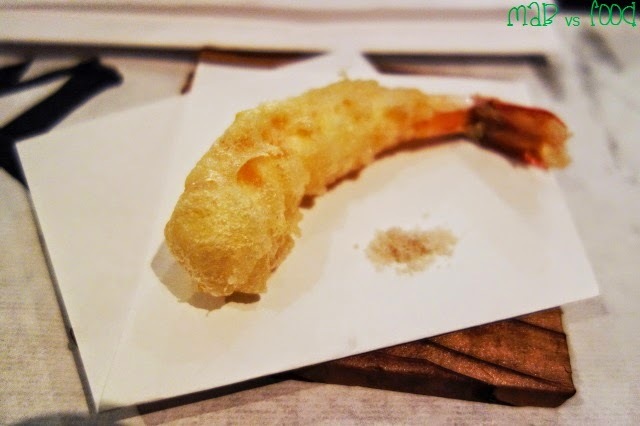 The tempura was freshly fried so you know that the batter was going to be crisp and the prawn piping hot. The Spencer Gulf prawn was a big, meaty prawn that was well cooked. After the body, we were served the prawns legs, which were delightfully crispy and flavoursome. I would have loved to have had the head too, complete with its brains, the tastiest part of prawns. 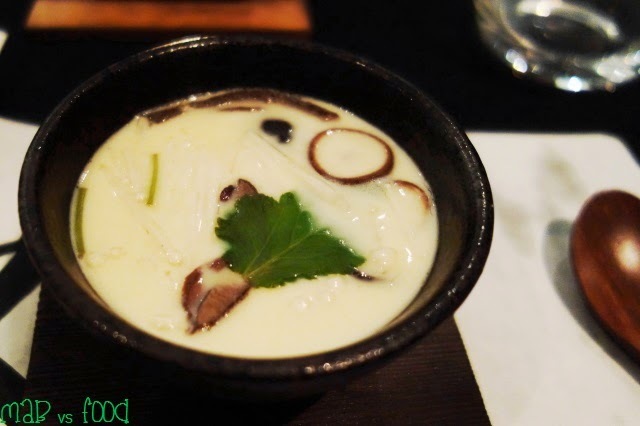 Chawanmushi (steamed dashi egg custard) is one of my favourite dishes in Japanese cuisine. But unfortunately I have not had too many excellent ones in Sydney. Tonight would be my lucky night as this version is one of the better ones I have tried in Sydney! The chawanmuishi was just gorgeous and the texture was spot on. It was soft, silky smooth and just set yet slightly soupy. Buried inside the egg custard was interestingly taro (or sato imo). Combined with my other love, mushrooms (which included enoki, shiitake, pine mushrooms), this dish proved to be one of the highlights of the evening! 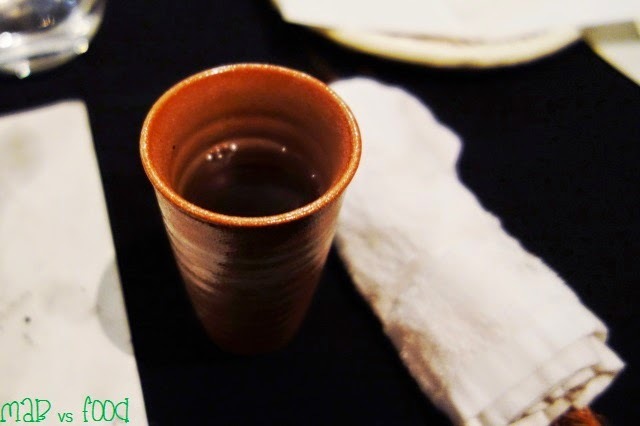 Jaga bata is a street food found in Hokkaido, which was the inspiration of the next course. 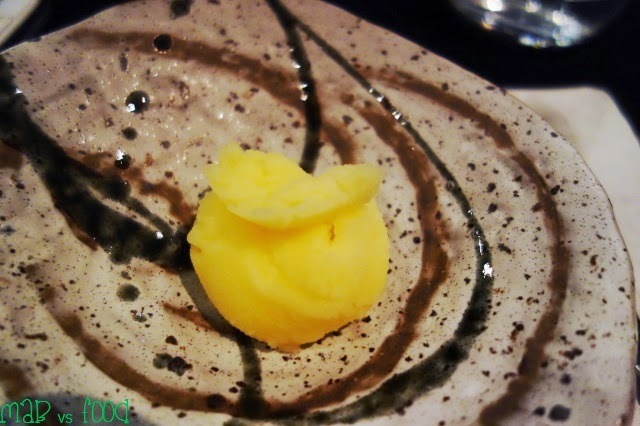 A fluffy, slightly smoky potato served warm with a slab of hand churned butter that melts into the spud. 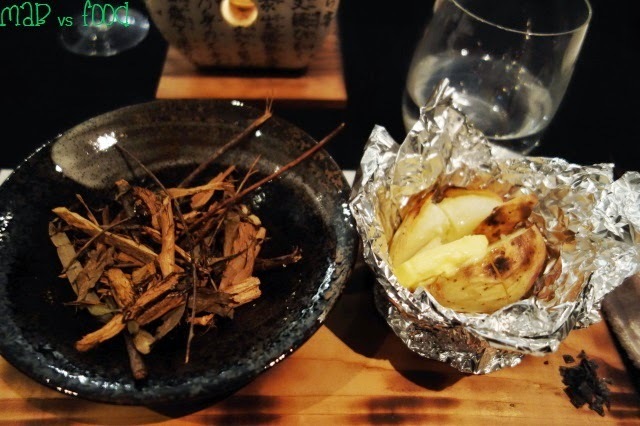 The potato was also served with some burning holm oak, which gave off an alluring smoky aroma. Sprinkle some charcoal salt flakes over the top of the potato and you get a delicious, creamy and comforting dish that is perfect for cold winter evenings. Some of the diners decided to enjoy every trace of butter by drinking the residual buttery liquid sitting on the foil. As tempting as this was, I figured I better save myself of the extra calories. Chicken is not a meat that I would usually order at a restaurant (with the exception of fried chicken) as I prefer to have it in the comfort of my home. But this grilled Burrawong chicken maryland was amazing! The meat was moist, juicy and just delicious; definitely one of the better chicken dishes I have had in a restaurant in recent times. And the salted yuzu pepper was the icing on the cake. It certainly packed a punch and I loved the zestiness of the yuzu. But then again I love yuzu in pretty much anything. This was my favourite dish of the night. The final savoury course of the evening was a Kagoshima style pork belly, which is slowly braised in soy, mirin and brown sugar til the sauce thickens. The pork belly was delectably fatty melt in your mouth stuff that goes so well with the sweet umami-licious braising sauce. The pork belly also came with a punchy smidgen of Karashi mustard. 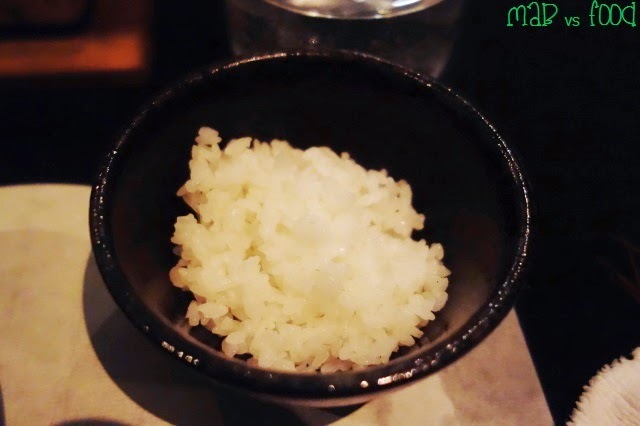 A bowl of fluffy rice was served with the pork belly, perfect for mopping up the braising sauce. 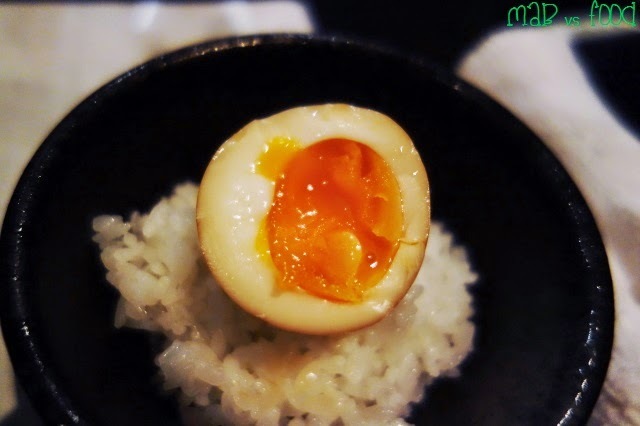 And that dashi egg and its rich, delightfully gooey egg yolk! Yes please! 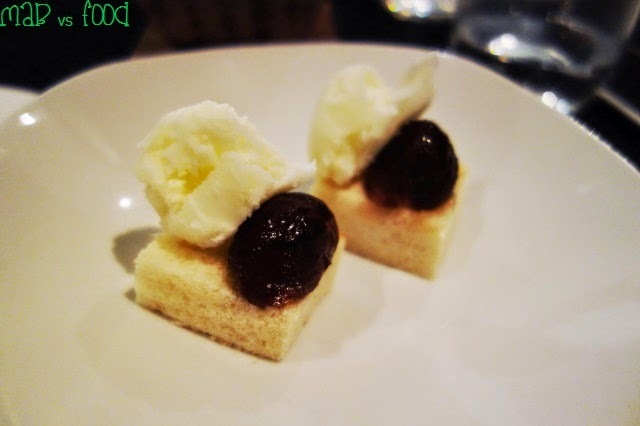 For dessert, it was mochi mochi bread holding a sugar preserved chestnut and milk sorbet. The mochi mochi bread, as the name suggests, was slightly chewy. The milk sorbet was milky (duh!) and refreshing. 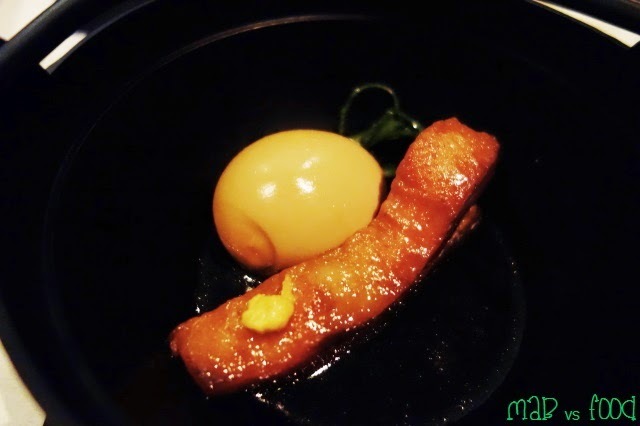 However, my favourite component of this dessert was the chestnut with its pleasant sweetness and lovely texture. And lastly, a scoop of kumquat sorbet, signalled the end of the meal. Anton explained to us that this was added to the menu at the request of one of the diners. I really enjoyed the tartness of this sorbet and how refreshing it was. This would be a lovely a pre-dessert at any restaurant. And a cup of hojicha (roasted green tea) was served with the kumquat sorbet as the diners continue to mingle and enjoy what was left of the night. Payment is made at the end of the meal with a suggested donation of $90 (cash only, no other forms of payment are accepted). 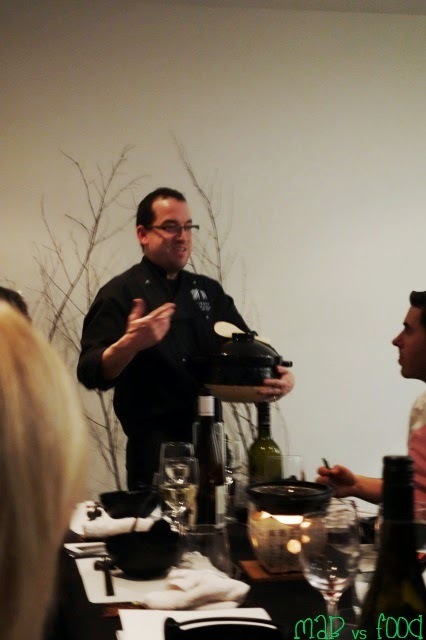 But I was happy to tip in a little more given the quality of the food and how enjoyable the experience was. And one that I am happy to come back again for. 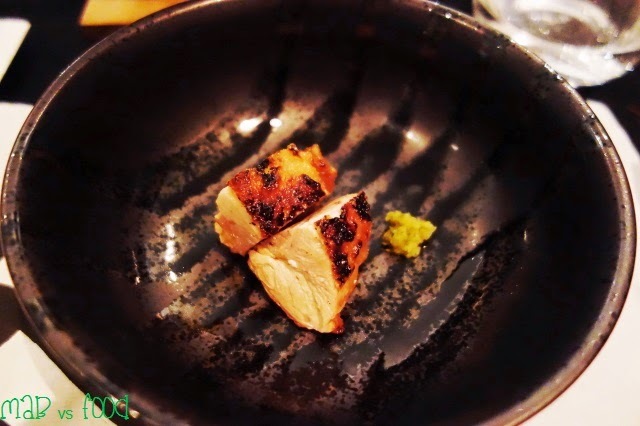 Highlight: The grilled chicken with yuzu pepper. And the chawanmushi. Lowlight: Spaces are limited so make sure you join the mailing list and keep an eye out on your emails so you don't miss out.